States that require students to pass, not just take, state exit exams to receive a high school diploma, even if the students have completed the necessary coursework with satisfactory grades. States in which the exit exams are a state mandate rather than a local option, in other words, states that require students in all school districts to pass exit exams, rather than allowing districts to decide for themselves whether to make the exams a condition of graduation. 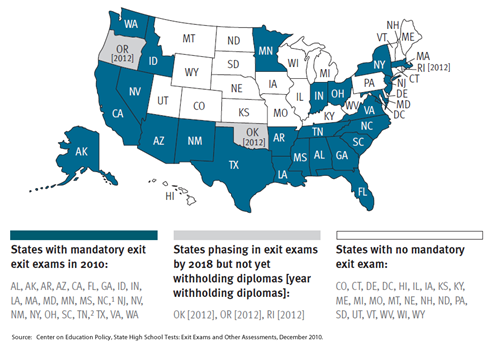 The 2010 CEP report finds that 28 states (see map at left) required high school exit exams in the 2009-10 school year (up from 26 in 2009). The percentage of public school students enrolled in states administering exit exams has now reached 74%. Meanwhile, tightening education budgets at both the state and local levels are impacted funding for programs related to high school exit exams, such as remediation services. The performance of students with disabilities across the states with exit exams varies greatly and, since each state administers a unique exam or series of exams, results are not comparable across states. However, a look at the pass rates of students with disabilities compared to all students within states provides a glimpse of the impact these exams are having on a significant portion of the nation’s 5.8 million school-age students with disabilities, 72% of whom are educated in states with exit exams currently in place. See the State-by-State Performance At a Glance section for more information. Advocates and parents should become involved in the policies developed by states regarding exit exams to ensure that such policies are fair and equitable for students with disabilities. While the right of states to impose high stakes exams has been well established through several court cases, it is imperative that it be done so in a nondiscriminatory manner. Do No Harm, a 2001 report examining the needs and rights of students with learning disabilities with regard to high-stakes standardized tests, identified essential elements of a fair and nondiscriminatory assessment system for students with learning and other disabilities that can be used as a checklist by advocates and parents. Lead Time: Sufficient advance time (4-6 years) so that students with learning disabilities will not be negatively impacted by an assessment system. Validity: An assessment system which actually tests what it was designed to measure and only for purposes and categories of students that have been validated. Testing What Was Taught: Guarantees that students are actually tested on material that they have learned in the classroom. Accommodations: Allowable accommodations that include any accommodation previously used and is listed in a student's IEP or Section 504 Plan. Parent Involvement: Decision making about a student's participation in the assessment system by IEP and Section 504 teams. Test Ability, Not Disability: Examinations that do not test a student's learning disability (e.g., tests that are required to be handwritten or that heavily emphasize spelling). Limit on High Stakes Test Use: Rarely, if ever, should standardized tests be given high-stakes consequences for students with disabilities. Alternate Assessments: Alternate assessments that allow learning disabled students to demonstrate their knowledge, rather than the effects of their disabilities. Appeal Procedures: Procedural safeguards to ensure that students are able to contest decisions about accommodations, alternate assessments, and scores on assessments. Information: Provision to students and parents of clear and accurate information about the assessment system, accommodations, alternate assessments, and appeals. The snapshots below are drawn from the state profiles produced by CEP as part of its December 2010 report, State High School Tests: Exit Exams and Other Assessments. The CEP state profiles provide a wealth of detailed information about each state’s exit exam(s). Readers are encouraged to download the full state profile (available in WORD format) for additional information. Does State Offer Alternate Paths to Graduation? Yes; Students with disabilities may also be exempted. Students with disabilities may graduate based on their IEP. Yes; See full CEP state profile for details. Yes; in addition, students with disabilities are identified as eligible for a waiver through the IEP process. No; but students with disabilities can apply for waiver. No; but students with disabilities may appeal for an alternate measure to reach graduation. No; but students with disabilities have alternate assessment options. No; See full CEP state profile for details. At this time New Jersey is unable to verify or report initial or cumulative pass rates. Yes, and some students with disabilities are exempt from passing. At this time New York is unable to verify or report initial or cumulative pass rates. Because Oregon’s policies are new, there are no student performance data to report at this time. Because Rhode Island’s policies are new, there are no student performance data to report at this time.